Improve video and audio quality by setting exact parameters. 4Easysoft AVI Converter is an easy-to-use video converter which can convert mainstream video files to AVI format. The key formats supported are: MOV, WMV, ASF, 3GP, VOB, MPG/MPEG2, FLV and HD video files. So you could enjoy the video and movie on your portable players such as Archos GMini402, iRiver PMP-100, Creative Zen, etc. 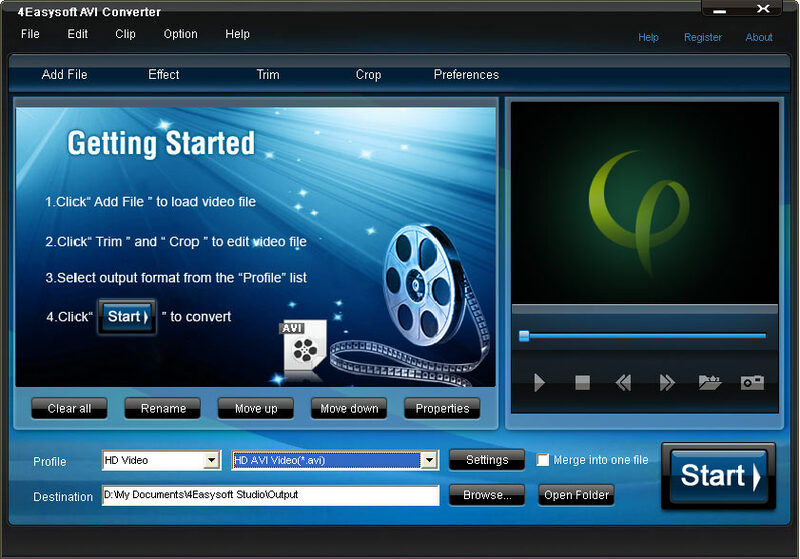 As the professional AVI Video Converter, 4Easysoft AVI Converter possesses a variety of video editing features such as adjusting video effect, trimming excellent video clip, cropping video to cut off the undesired black edges, and watermarking on video. Possessing this AVI Converter, you will have a wonderful digital entertainment life! How to Convert AVI to MP4 format?